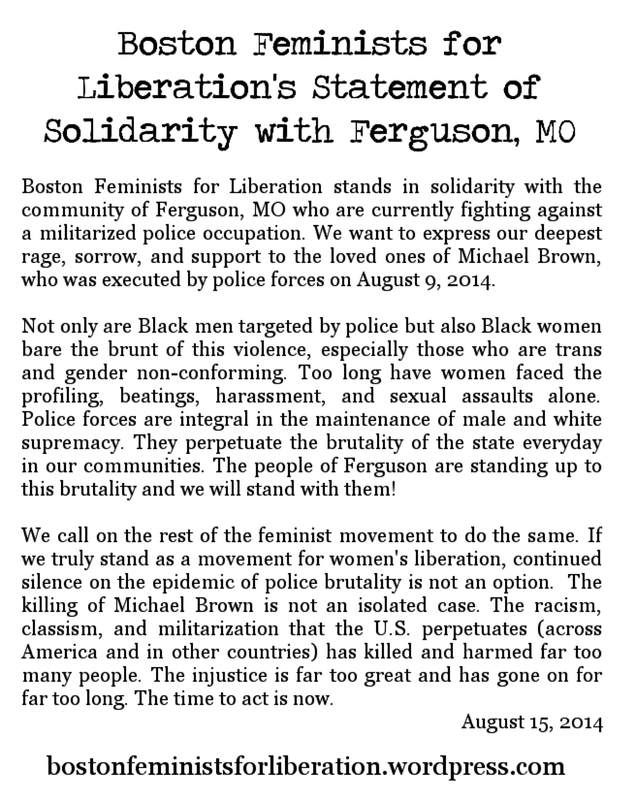 Boston Feminists for Liberation stands in solidarity with the community of Ferguson, MO who are currently fighting against a militarized police occupation. We want to express our deepest rage, sorrow, and support to the loved ones of Michael Brown, who was executed by police forces on August 9, 2014. Not only are Black men targeted by police but also Black women bare the brunt of this violence, especially those who are trans and gender non-conforming. Too long have women faced the profiling, beatings, harassment, and sexual assaults alone. Police forces are integral in the maintenance of male and white supremacy. They perpetuate the brutality of the state everyday in our communities. The people of Ferguson are standing up to this brutality and we will stand with them! We call on the rest of the feminist movement to do the same. If we truly stand as a movement for women’s liberation, continued silence on the epidemic of police brutality is not an option. The killing of Michael Brown is not an isolated case. The racism, classism, and militarization that the U.S. perpetuates (across America and in other countries) has killed and harmed far too many people. The injustice is far too great and has gone on for far too long. The time to act is now.